Following the Fourth Division results from 2012, the Kansas City Royals will be the last original bottom division team in 2013. The Pittsburgh Pirates and Baltimore Orioles are moving up. The Pittsburgh Pirates, Baltimore Orioles and Kansas City Royals finally showed real signs of improvement within the Fourth Division in 2012. 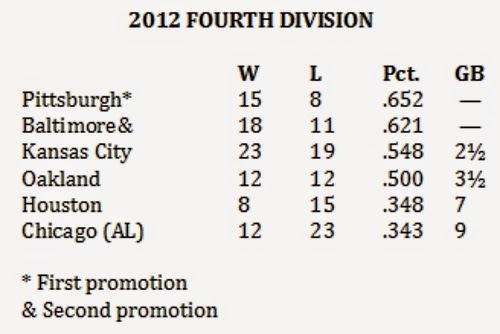 The Pirates and Orioles both improved enough to win Third Division promotion for 2013. The Royal remain the only team in the original 2010 Fourth Division to remain in the basement level. The Pirates finished with the best winning percentage, though the Orioles didn't finish any games behind them. The Pirates, 79-83 during the Major League season, still didn't go to the playoffs, but the Orioles (93-69) entered as the second wild card in the American League. The Houston Astros were spared a second consecutive cellar finish, thanks to the tumbling Chicago White Sox, who finished nine games from the top.